Mammoth Mountain Ski Resort is one of the largest ski areas in the United States. 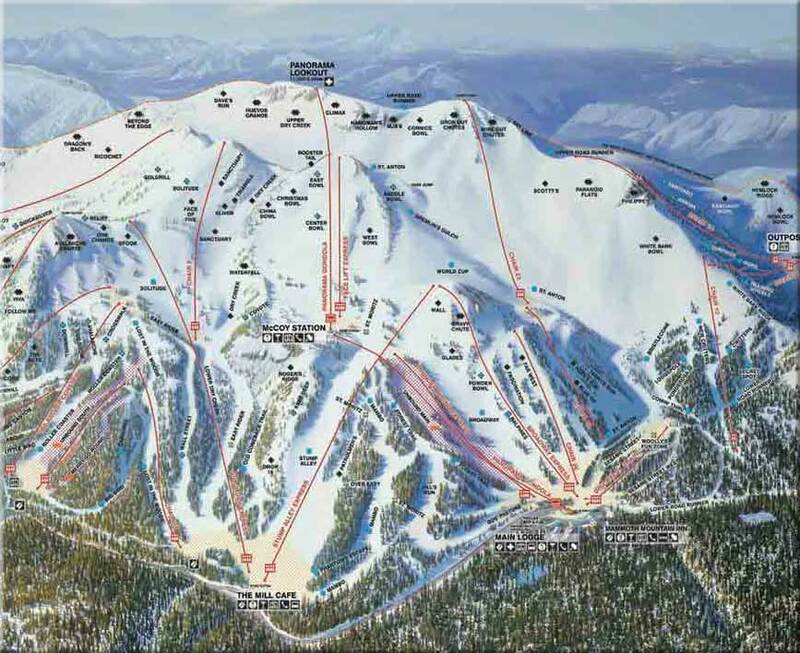 With hundreds of ski runs for all levels, 3 terrain parks, it compares in size to Vail, Colorado. When you are skiing in Mammoth you will have access to 32 lifts, 7 detachable quads, a six-pack, the top to bottom Panorama Gondola, and The Village Gondola from the center of town to the ski area. Click the map to see a larger size. There is a reason it has it's name. Mammoth Mountain is "Mammoth". If you're coming skiing or snowboarding, you'll want to get your lodging in Mammoth close to the slopes. The base lodge area known as Canyon Lodge and Eagle Lodge both have accommodations within walking distance of the chair lifts. This makes it very accessible for families especially those with younger kids. Then mom and dad won't have to carry their boards. Recently the ski resort moved around some of their chair lifts to make the whole mountain accessible so no matter where you start, you can get to the other side. If you're a good skier, you might try and see if you can take every chair in a day. Most can't. Some of the favorite runs here include Dave's Run, Huevos Grandes, and the Paranoids. The names pretty much tell you what it is all about.